2017년 1월 출범 후 트럼프 행정부의 대외전략 및 안보·국방정책은 여전히 모호한 상태로 남아 있다. 트럼프의 당선은 기존 정치질서에 대한 반감의 표출이기 때문에 대외정책에 있어서도 큰 변화가 예상되었으나 출범 후 일부 정책은 수정되어 집행되기도 하는 등 뚜렷한 방향성은 드러나지 않고 있다. 본 연구는 지난 대선 기간부터 출범 후 최근까지 트럼프 대통령 및 고위 인사들의 정세 인식과 주요 정책 행보에 대한 분석을 바탕으로 주요 안보·국방 정책의 방향을 예측해 보고 대한반도 정책을 도출하는 것을 목표로 한다. 트럼프 대통령은 미국 우선주의를 내세워 국제질서에서 리더십 역할을 축소하고 동맹국을 대상으로 철저한 비용 분담을 요구할 것을 예고했으나 국제질서 및 동맹으로부터 파생되는 미국의 장기 국가이익을 고려 시 과거행정부와 유사한 방향을 지향해 나갈 것이 예상된다. 한국은 방위비 협상 등 현안을 원만하게 해결해 나가고 북핵 억제를 위한 방위태세 강화를 추진하면서 북한 비핵화 달성을 위해 미국과 함께 대북정책 방향을 효과적으로 조율해 나가야 하는 과제를 안고 있다. Trump administration's foreign policy and security strategy are still ambiguous after the inauguration of January 2017. Since the election of Donald Trump is the expression of objection to the existing political establishment, huge change was expected in the direction of overall foreign policy. However, it is true that some of the policies have been conducted in the ways different from what Trump declared during the election campaign. 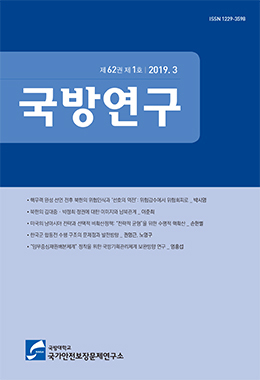 The article aims to prospect the direction of the administration's security strategy based on the analyses of the major policies and statements of Trump administration after its inauguration and provide policy recommendations for the ROK-US alliance. Although the president Trump announced America First on which US will reduce its leadership role in the world order, and pursue strict burden sharing with allies, the administration's security policies will gradually resemble those of the past governments considering the long-term US national interests arising from stable international order and alliance network. South Korean government should effectively coordinate the policy toward North Korea with US dealing with various current issues of the alliance in a way mutually beneficial to each other, and strengthening the defense posture countering rapidly increasing North Korean nuclear and ballastic missile threats.